Some of the items listed below are linked to downloads as Adobe PDF documents. You can download Adobe Acrobat Reader for free if your machine doesn't already have it. 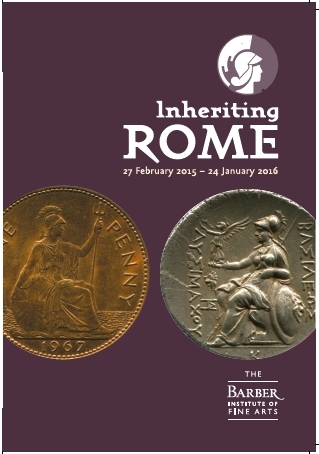 Inheriting Rome: the imperial legacy in coinage and culture (Birmingham: the Barber Institute of Fine Arts 2015), a leaflet accompanying my exhibition of the same name. 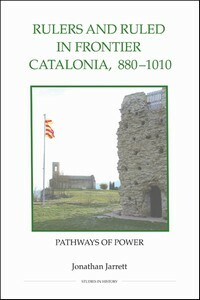 Rulers and Ruled on the Catalan Frontier, 880-1010: pathways of power, Studies in History (London: Royal Historical Society 2010). A monograph expanded and revised from my doctoral thesis, available to purchase here and here. Coins in Collections: care and use. 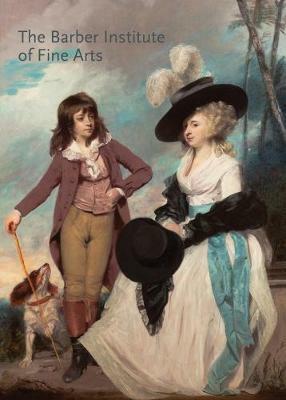 A Guide to Best Practice by the COINS Project (Cambridge: Fitzwilliam Museum 2009), main author with assistance from Mark Blackburn, Jo Dillon, Achille Felicetti and Klaus Vondrovec. Richard Verdi, Sarah Beattie, myself, Nicola Kalinsky and Robert Wenley, The Barber Institute of Fine Arts (London: Scala Arts & Heritage, 2017): a new guide to the collections of my erstwhile employers, the Barber Institute of Fine Arts in the University of Birmingham, with contributions from myself as follows: "(Roman) The Pax Romana, AD 41-42" [presentation of a Nemesis denarius of Claudius I, R0943], p. 18; "(Persian) The Shah of Shahs, 4th Century" [presentation of a drachm of Shapur II, S0078], p. 19; and "(Rhodes) St John and the Knights of the Hospital, 15th Century" [presentation of a ducat of the Hospitallers of Rhodes, CR0037], p. 20. Available directly from the publishers or at many and varied art bookshops! 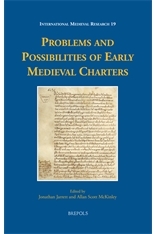 Problems and Possibilities of Early Medieval Charters, edited by myself and Allan Scott McKinley, International Medieval Research 19 (Turnhout: Brepols 2013): a volume of papers from seven years of highly successful sessions run by Allan, myself and Martin Ryan at the Leeds International Medieval Congress, now available in whole here or in parts here! Contains chapters by myself (twice, see below), Martin Ryan, Allan, Erik Niblaeus, Charles West, Arkady Hodge, Antonio Sennis, Charles Insley, Shigeto Kikuchi, Morn Capper, Elina Screen, Alaric Trousdale and Julie Hofmann. "Outgrowing the Dark Ages: agrarian productivity in Carolingian Europe re-evaluated" in Agricultural History Review Vol. 67 (Reading: University of Reading Press), in press. "Engaging Élites: counts, capital and frontier communities in the ninth and tenth centuries, in Catalonia and elsewhere" in Networks and Neighbours Vol. 2.2 (Binghamton, NY: Networks and Neighbours, 2018 for 2014), pp. 202-230, online at https://nnthejournal.files.wordpress.com/2018/05/nn-2-2-jarrett-engaging-elites1.pdf, last modified 26th May 2018 as of 12th April 2019. 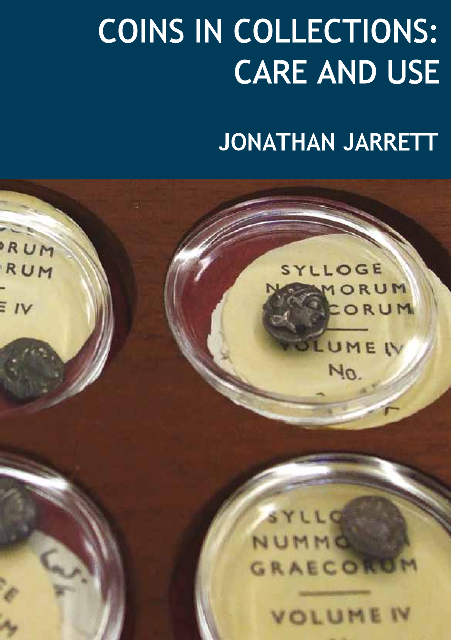 "Middle Byzantine Numismatics in the Light of Franz Füeg's Corpora of Nomismata" in Numismatic Chronicle Vol. 177 (London: Royal Numismatic Society 2018 for 2017), pp. 514-535. "Views, Comments and Statistics: Gauging and Engaging the Audience of Medievalist Blogging" in E-medieval: teaching, research and the 'net, edd. Orietta Da Rold & Elaine Treharne, Literature Compass Vol. 9.12 (Oxford 2012), pp. 991-995, doi:10.1111/lic3.12016. "Caliph, King or Grandfather: strategies of legitimisation on the Spanish March in the reign of Lothar III" in The Mediaeval Journal Vol. 1.2 (Turnhout: Brepols 2012), pp. 1-21, doi:10.1484/J.TMJ.1.102535. "Archbishop Ató of Osona: false metropolitans on the Marca Hispanica" in Archiv für Diplomatik Vol. 56 (München 2010), pp. 1-41. I have some offprints of this left as well so if you can't get hold of it, once again, get in touch. "Settling the Kings' Lands: aprisio in Catalonia in perspective" in Early Medieval Europe Vol. 18 (Oxford: Wiley-Blackwell 2010), pp. 320-342, doi:10.1111/j.1471-8847.2010.00301.x. I'm forbidden by the copyright agreement from posting this online, because it can be purchased (or viewed if you have a subscription) here, but I am allowed to circulate a PDF privately so if you can't get hold of it, get in touch. "Currency change in pre-millennial Catalonia: coinage, counts and economics" in Numismatic Chronicle Vol. 169 (London: Royal Numismatic Society 2010 for 2009), pp. 217-243. Proof version online here as PDF. I have loads of offprints of this: if you would like one, contact me. "Digitizing Numismatics: getting the Fitzwilliam Museum's coins to the world-wide web" in The Heroic Age Vol. 12 (online at http://www.heroicage.org/issues/12/foruma.php, last modified 12 June 2009 as of 17 June 2009). "The Political Range of Áedán mac Gabráin King of Dál Riata" in Pictish Arts Society Journal Vol. 17 (Brechin: Pictish Arts Society 2008), pp. 3-24. This paper was first written in 2000 and was originally scheduled to emerge in 2001; as it finally came out it is missing its graphics and its endnotes, and spells my name wrong. A correct version can be downloaded here, with its bibliography here, both files PDF. "Power over Past and Future: Abbess Emma and the nunnery of Sant Joan de les Abadesses" in Early Medieval Europe Vol. 12 Pt 3 (Oxford: Blackwells 2004 for 2003), pp. 229-258, doi:10.1111/j.0963-9462.2004.00128.x. Winner of the Blackwells/Early Medieval Europe Prize for Best First Published Essay 2004. An electronic copy of the text of this paper is linked here as PDF; the definitive version is available through Wiley-Blackwell's Online Library service. "Centurions, Alcalas and Christiani perversi: Organisation of Society in the pre-Catalan 'Terra de Ningú'" in †A. Deyermond & M. Ryan (ed. ), Early Medieval Spain: a symposium, Papers of the Medieval Hispanic Research Seminar 63 (London: Queen Mary University of London 2010), pp. 97-127. "Introduction" in Jarrett & McKinley, Problems and Possibilities as above, pp. 1-18, doi:10.1484/M.IMR-EB.1.101674. "Comparing the earliest diplomatic culture in Carolingian Catalonia" in Jarrett & McKinley, Problems and Possibilities as above, pp. 89-126, doi:10.1484/M.IMR-EB.1.101679. "Only Typing? Informal Writing, Blogging and the Academy", by myself and Alex Sayf Cummings, in Kristen Nawrotzki & Jack Dougherty (edd. ), Writing History in the Digital Age, digitalculturebooks (Detroit: University of Michigan Press 2013), pp. 246-258, online here. "Bibliography", with Miquel Crusafont, Anna M. Balaguer & Philip Grierson, in Crusafont, Balaguer & Grierson, Medieval European Coinage, with a catalogue of the coins in the Fitzwilliam Museum, 6: the Iberian Peninsula (Cambridge 2013), pp. 590-637. "Ramiro I and Ramon Berenguer IV", by Miquel Crusafont and myself in Crusafont, Anna M. Balaguer & Philip Grierson, Medieval European Coinage, with a Catalogue of the Coins in the Fitzwilliam Museum, 6: the Iberian Peninsula (Cambridge 2013), pp. 105-108. "Coinage, Digitization and the World-Wide Web: numismatics and the COINS Project", by myself, Sebastian Zambanini, Reinhold Hüber-Mork and Achille Felicetti, in Brent H. Nelson & Melissa Terras (edd. ), Digitizing Medieval and Early Modern Material Culture, New Technologies in Medieval and Renaissance Studies 3 (Tempe: University of Arizona Press 2012), pp. 459-489. Josep María Salrach, Justícia i poder en Catalunya abans de l'any mil (Vic 2013) in The Medieval Review 14.09.16, online at https://scholarworks.iu.edu/journals/index.php/tmr/article/view/18659/24772, last modified 15 September 2014 as of 27 September 2014. Julia Escalona & Andrew Reynolds (edd. ), Scale and Scale Change in the Early Middle Ages, The Medieval Countryside 6 (Turnhout: Brepols 2011), in Història agrària 59 (Valencia 2013), pp. 193-197. Reinhard Härtel, Notarielle und kirchliche Urkunden im frühen und hohen Mittelalter (Wien 2011), in The Medieval Review 12.06.21 (Bloomington: University of Indiana 2012), https://scholarworks.iu.edu/journals/index.php/tmr/article/view/17591/23709. Jörn Staecker (ed. ), The Reception of Medieval Europe in the Baltic Sea Region. Papers of the XIIth Visby Symposium held at Gotland University, Visby, Acta Visbyensia XII (Visby: Gotland University Press 2009), in Fornvännen: Journal of Swedish Antiquarian Research 2011/1 (Stockholm: the Royal Academy of Letters, History and Antiquities 2011), pp. 65-67. Donald Scragg (ed. ), Edgar, King of the English 959-975, Publications of the Manchester Centre for Anglo-Saxon Studies 8 (Woodbridge: Boydell 2008), in The Heroic Age Vol. 13 (2010), online here. Kathleen Davis, Periodization and Sovereignty: how ideas of feudalism and secularization govern the politics of time, The Middle Ages (Philadelphia 2008) in Early Medieval Europe Vol. 18 (Oxford: Wiley-Blackwell 2010), pp. 348-349, online for purchase or subscription here. Stephen D. White, Feuding and Peacemaking in Eleventh-Century France, Variorum Collected Studies Series (Aldershot: Ashgate 2005) in Early Medieval Europe Vol. 15 (Oxford: Blackwells 2007), pp. 124-125, online for purchase or subscription here. Since the publication of my thesis as a monograph (detailed above) is quite different from the submission version of my thesis, and since people have been kind enough to cite that, I have created this page where PDF copies of my thesis chapters can be downloaded. I've spent a good deal of my career in museums, which allows one the opportunity to put stuff on display for audiences academic work just doesn't receive. These are the cases (no pun intended) in which I have been involved in that, some of which still have online vestiges and some of which were entirely online in the first place. Tokens of Revolution: the propaganda coins of Thomas Spence and his contemporaries, virtual exhibition online at the Fitzwilliam Museum, Cambridge, since 24 September 2010 (design, all text, imaging and code except where otherwise credited; website framework by Shaun Osborne). Antonio Rodriquez and the New Zealand Cross, virtual exhibition online at the Fitzwilliam Museum, Cambridge, since 19 August 2010 (design, all text, imaging and code except where otherwise credited; website framework by Shaun Osborne). Anglo-Saxon Art in the Round. An Exhibition of Anglo-Saxon Coins and Artefacts to Celebrate the Acquisition by The Fitzwilliam Museum of the De Wit Collection of Early Anglo-Saxon Pennies, Octagon Gallery, Fitzwilliam Museum, Cambridge, 23 May to 7 September 2008, some imaging, prints and some installation, also accompanying virtual exhibition online at http://www.fitzmuseum.cam.ac.uk/gallery/anglosaxon/, last modified 21 April 2009 as of 17 June 2009 (design, some imaging and code; texts by Mark Blackburn, website framework by Shaun Osborne). "Coin of the Moment: Harry Meader's Sea Gallantry Medal", virtual exhibition page online at the Fitzwilliam Museum, Cambridge, 28 March 2008 to 12 March 2016 (research, design, text, imaging and code; website framework by Shaun Osborne). "Coin of the Moment: the gold penny of King Henry III, 1257-58", virtual exhibition page online at the Fitzwilliam Museum, Cambridge, 19 July 2007 to 10 April 2016 (imaging and code; text by Martin Allen, website framework by Shaun Osborne). The Imagery of War, Octagon Gallery, Fitzwilliam Museum, Cambridge, 9 May to 27 August 2006; imaging, poster design and prints, accompanying virtual exhibition (design, imaging and code; texts by Mark Blackburn and Martin Allen, website framework by Shaun Osborne). For further details of works in progress, for several of which I have texts available, see the Projects page. "Legends in their own Lifetime? The late Carolingians and Catalonia", Haskins Society Conference, Georgetown University (in session 'The Legend of Charlemagne and the Negotiation of Power'), 11 November 2008. "The view from a coin room: the COINS project and numismatic study", EVA Vienna Conference 2008 "Digital Cultural Heritage: Essential for Tourism", Österreichische Akademie der Wissenschaften, Vienna (in session 'Coin Recognition Workshop'), 27 August 2008. "Documents that shouldn't survive: preservation from before the archive in Catalonia and elsewhere". International Medieval Congress, University of Leeds (in submitted session 'Problems and Possibilities of Early Medieval Diplomatic, II: was it filed or was it lost? '), 7 July 2008. "Centurions, Alcalas and Christiani Perversi: organisation of society in the pre-Catalan terra de ningú". Second Colloquium on the Cultures of Christian and Islamic Iberia, University of Exeter, 3 September 2007. "Uncertain Origins: comparing the earliest documentary culture in Carolingian Catalonia". International Medieval Congress, University of Leeds (in submitted session 'Problems and Possibilities of Early Medieval Diplomatic, I: Formulas and Realities – Did Charters Reflect Real Life? '), 9 July 2007. "Currency change in pre-millennial Catalonia: coinage, counts and economics". Department of Coins & Medals, Fitzwilliam Museum, Cambridge, 4 May 2007. "Neo-Goths, Mozarabs and Kings: chronicles versus charters in tenth-century León". Earlier Middle Ages Seminar, Institute of Historical Research, London, 7 February 2007. "An ivory tower over the palace? Gothic self-image in tenth-century León". Fifth Conference of Historians of Medieval Iberia, St Andrews, 7 September 2006. "Fixing documents in Carolingian-period Catalonia". International Medieval Congress, Leeds (in submitted session: 'Clods, altars, records and donors: reading narratives and emotions in early medieval charters'), 11 July 2006. "Aprisio in Catalonia in perspective", Fourth Conference of Historians of Medieval Iberia, Exeter, 15 September 2005. "Sales, swindles and sanctions: Bishop Sal·la of Urgell and the counts of Catalonia". International Medieval Congress, Leeds (in session: 'Telling Laymen What to Do'), 21 July 2005. "The Continuation of Carolingian Expansion: splitting hairs in medieval Catalonia". Second Conference of Historians of Medieval Spain and Portugal, Liverpool, 15 September 2003. "Archbishop Ató of Vic: ecclesiastical separatism in Carolingian Catalonia". EMERGE Conference 2003, St Andrews, 13 September 2003. "Power over Past and Future: Abbess Emma and the abbey of Sant Joan de les Abadesses". Earlier Middle Ages Seminar, Institute of Historical Research, London, 28 May 2003. "The Political Range of Áedán mac Gabráin, King of Dál Riata". EMERGE Conference 2000, Edinburgh, 7 September 2000.